Crush the candy canes on a thick cutting board using the back of a knife or some other utensil suitable for the task. Mix flour, almond flour, sugar and vanilla sugar in a bowl. Add approximately 4 crushed candy canes to the bowl, mix well. Ensure that the pieces from the candy canes that you add are as small as possible. The powder from crushing the candy canes is great to add for flavour. Cut the vegetable margarine in smaller cubes, add piece by piece and work into a dough. Let the dough rest in the fridge or freezer to firm and make it more manageable for the cookie making. Once the dough is firm enough, divide it into four pieces and create four long equally sized long rolls. Then use a sharp and cold knife to cut equally sized slices and place on a oven tray covered with baking paper. 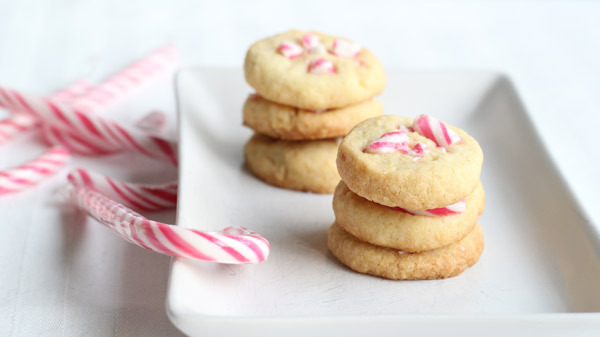 Decorate the top of the cookies with the rest of the crushed candy canes. Bake in a preheated oven, on 175 C / 347 F degrees for 15-20 minutes depending on the size of your cookies. It sounds like to much vegetable margarine? 200 grams of vegetable margarine roughly converts to 7 oz. Also did you include the almond flour and powdered candy canes in the dough? That helps with keeping their shape. And the quantity all depends on how big you make your cookies. I got between 40-50 from my batches. I hope the advice helps! Thanks for getting back to me. I just checked again. I believe 7 oz is about 1 cup. I used Earth Balance. 1 cup reg flour and 3/4 cup of almond flour. This was the first time I’ve used almond flour. It had more of a miel type consistancy. I did put in the candy cane. When I rolled the log it held together well but upon baking, the cookies are more like a lace cookie. I cut the log in approx. inch sized slices and they were about 1 1/2 inches across. Help!!! Your look so good. Anyway, here is what I would do – try using less of the vegan butter, prepare 200 grams / 7 oz however slice it up into cubes, and add a little by little as you work together with the dry ingredients. And if you are happy with the texture of the dough (aka its firm and holds well together), don’t add more of the vegan butter. Try adding a splash of really cold water as well halfway through adding the vegan butter. I’ve never used Earth Balance, so I have no experience of it (people say its really good). The vegan butter I use is made from sunflower, rapeseed and linseed oil. Perhaps that will make a bit of a difference too. Maybe the earth balance is a bit “softer” then the vegan butter i use, if so try to go 1 cup white flour and 1 cup almond flour when/if you try again and add try the technique with the vegan butter. And the sugar I used for these cookies are white sugar as well, which makes the cookies a bit harder. About the size, when I do the cookies, I do them pretty small, since I’m all about small treats :) I do them approx 2 cm (0,7 inches?!) in radius so to speak. I hope this helps and I’m happy you visited my site!